A former government testing facility, X Sector has more recently been taken over by the Ministry of Joy for their top secret experiments. The area is a stark industrial landscape of concrete and metal, contrasting with the leafy Staffordshire countryside that surrounds it. As guests enter the area, they are greeted by imposing metal fencing and flashing warning beacons, with various health warnings adding to the foreboding atmosphere. Descending into the area, the view is dominated on one side by the twisted metal of The Smiler with The Marmaliser towering over the track. This is complimented on the other side of the path by the imposing drop of Oblivion, which descends through the billowing mist into its vast pit a little further into the area. Decending into the area, you pass between the various sleek concrete structures housing The Fried Chicken Co. and Re-Hydrator to reach the various ride entrances. The air is filled with the warped music billowing from The Smiler, which both contrasts but blends seamlessly into the heavy techno soundtrack of Oblivion. Elsewhere The Ministry of Joy has other experiments set up make guests smile, such as the Enterprise which nestles within the final bend of Oblivion. Not all the ministry's experiments are successful though and at the bottom of X Sector lays a peaceful garden where Submission, a failed attempt to bring joy, once resided. The area began its life as Springfield Centre, playing host to the Pirate Ship, Cine 2000, and Dinosaur Land. In 1984, the opening of the Turbo Star and Black Hole in the place of the Dinosaurs prompted a re-theme to Fantasy World. 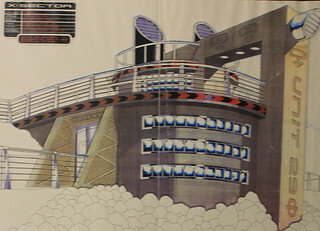 Turbo Star was later removed after only five years of service in favour of Gravitron, though this only lasted three seasons, being removed in 1992. The area's most significant change, however, was in 1997, when suddenly all the rides bar the Black Hole were removed to make way for the construction of Alton Towers' latest Secret Weapon: Oblivion. Oblivion opened the following year, accompanied by the relocation of both Enterprise and Energizer to the newly re-themed X Sector. In 2001, Energizer returned to its original home in Ug Land, and in its place came Submission. In 2005, after 20 years of service, the Black Hole was closed down and subsequently sold, though its tent remained right up until 2012 when it was removed to make way for The Smiler, which opened the following year. More recently, Submission was retired from the area at the start of 2014, leaving potential for future developments.